In recent years, the publishing houses have been under siege. Like any good science fiction epic, the technological world has figuratively battered at the archaic realms of the written word. It has attempted to force the book and the magazine onto digital platforms. Yet, like any fantasy hero, the publishing houses scream at the top of their lungs, “we will not go quietly!” With the publishers going from strength to strength, it seems that resistance isn’t futile after all. However, there is an irony to this tale. A key weapon in the publishing industry’s success against obscurity is the very technology that has threatened it. In 2015, according to the “Email Industry Census – Key Sector Report”, Publishing bulldozed past Retail to the top spot for ROI? How is the industry that should have been slaughtered by e-readers and tablets, actually coming out on top? Let’s be fair – when it comes to segmentation these people know what they are doing. You can see it from the moment you walk into a bookshop. You will not go wandering aimlessly around a jumble sale looking for The Hunger Games, only to find it hidden beside Taoism for Dummies. There are so many different styles and formats. Publishers learned a long time ago, that if customers are going to buy more books, they need to be segmented into genres. Take Penguin Random House for example. By the time I had finished this quiz, and by the time I have chosen my preferred three genres, I know I am not going to receive newsletters attempting to push new editions of Stephane Meyer or E.L James . Not that there is anything (much) wrong with their work. Instead, I will receive tantalising offers tailored to my keen interest in Chuck Palahniuk and Science Fiction. Let’s be honest. People in the publishing industry are creative writers. Every office has an Ernest Hemingway seated opposite an Angela Carter. They write blurbs for a living, they read and edit the best and newest creative materials on the market. If you read any blog on Email Marketing 101, one of the most common portions of advice served urges you to be creative. In the publishing industry, creative language is second nature. Those tempting offers decorated with mysterious or mouthwatering subject lines come with the territory. And so it should. The publishing industry literally markets to linguistic connoisseurs. If there is one thing that the publishing industry can certainly attest to, it is that creativity is certainly rewarding in your email marketing campaigns. Right from their very first email to a customer, even the smaller publishing houses are waving around their free samples. It might a handful of poems from an upcoming book. Or, the first couple of chapters of a YA dystopia ready to explode into Waterstones. Maybe even an e-book for 99p. Needless to say, publishers manage to offer, and deliver, free samples and killer discounts to the recipients of their well prepared email marketing campaigns. I recognise, however, that not every industry would be able to achieve this. Technology is gradually achieving some amazing things, but I am yet to see anyone effectively deliver free samples of pepperoni pizza via email. In this, it would seem that the publishing industry has the advantage over other industries whose sales rely upon physical products. Yes it is true, other businesses send discount codes or vouchers through their email, but few tangible products can be received by a customer checking their phone on the bus to work. Even though the literary industries haven’t fully embraced the technological advancements of the twenty-first century, there is no doubting the prowess of its giants. Perhaps there is a future where books will no longer be printed, and all literary works are reduced to e-readers and tablets; and for some that is a sad future. 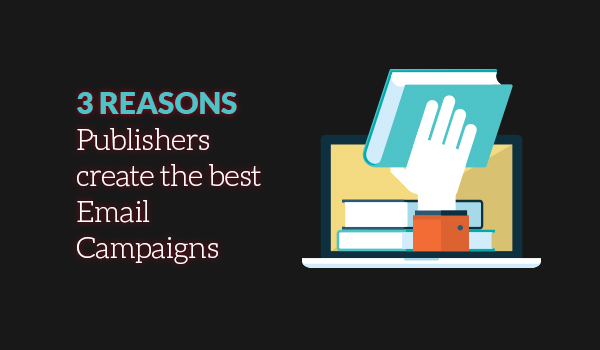 But for the publishing industry, they are already light years ahead in terms of email marketing ROI. If that moment comes when the bookshelf is a mere app holding files, then the publishing industry is primed and ready to make that transition.